I am always looking for ways to introduce new and interesting flavors into our food. I was very intrigued when I saw this recipe for Moroccan BBQ sauce and knew that I had to try it. I've often cooked lamb, but have never used a bbq sauce with it. I thought that this bbq sauce recipe was perfect for lamb as it has enough flavor to stand up to the meat. The flavor of the cilantro was front and center. It was sweet from the honey and heady with the flavor from the whole star anise and cinnamon. We did not use this BBQ sauce to baste the lamb as it cooked, we enjoyed it on the lamb after it was cooked. 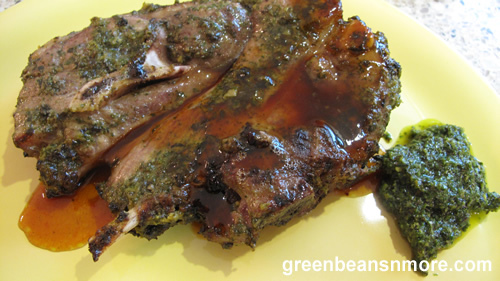 The lamb is marinated for 24 hours in a mint chutney prior to grilling. I chose to grill lamb shoulder steaks as they offer much more meat than loin lamb chops. As it was raining on the day I cooked this lamb I broiled it inside. I broiled the lamb shoulder steaks 4 " from the heat source, 9 minutes per side. Like other meats, lamb needs to rest after cooking. I let the shoulder steaks rest for 5 minutes. Cooking lamb is not difficult at all. If you're looking for information on how to cook lamb and for some wonderful lamb recipes check out this site - Americanlamb.com. You'll find everything you need to know about choosing cuts of lamb and how to cook them perfectly. Please read my "cooks tips" following the recipe. 1/4 teaspoon each ground ginger, ground cardamom, whole cloves, hot chile flakes, and salt. Combine all ingredients in a 2- to 3-quart pan. Bring to a simmer over medium-high heat; cook, stirring occasionally, until sauce is reduced to about 1 1/4 cups, about 15 minutes. Pour through a fine strainer into a bowl. Makes about 1 1/4 cups. Cooks tips: I did not use a low sodium soy sauce so I did not add the 1/4 teaspoon salt called for later in the recipe. I didn't miss it. I also let the mixture simmer for 1 hour. For the best results make this sauce a few days in advance to allow the flavors to mingle. This recipe for Moroccan BBQ sauce and the accompanying mint chutney is from homemade-recipes.blogspot.com. © 2019 greenbeansnmore.com - All rights reserved.